The Grand Caravan is part of the oldest nameplate currently used by Chrysler, the automaker responsible for birthing it in the 1984 model year. The 2019 entry is part of the minivan’s fifth generation of production. The 2019 Dodge Grand Caravan, which has no changes from the previous model year, is split into SE, SE Plus, and SXT trims. Standard exterior features on the new Dodge Grand Caravan include a bright black grille, halogen quad headlights with turn-off time delay, power heated side mirrors with manual fold-away ability, a rear window wiper and washer, and 17-inch steel wheels. On the SE Plus, Chrysler adds fog lights for penetrating illumination so that you can see more of what’s in front of you, auto on-off ability (instead of mere turn-off time delay) so that the headlights can automatically turn on or off depending on the amount of outdoor light, and 17-inch polished alloy wheels with gloss-black pockets. 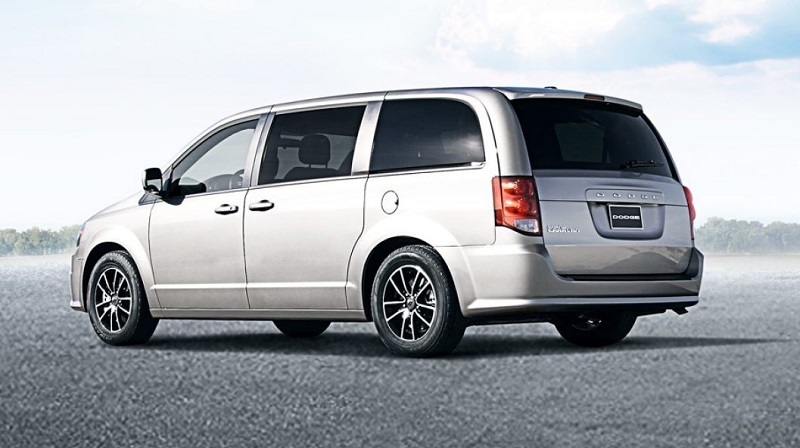 Power sliding doors are exclusive to the SXT for increased convenience of getting in and out of the minivan, and the trim is fitted with silver-finished 17-inch alloy wheels. Optional on the minivan are features like roof rail crossbars or side roof rails and Mopar® running boards and splash guards. 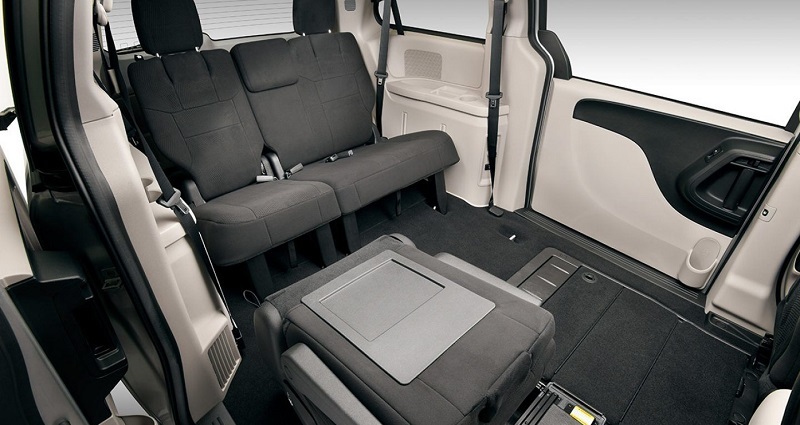 This minivan has three rows of seats that can accommodate up to seven people. The second and third rows in particular use a mechanism called Stow ‘n Go®, which enables the former to be folded flat into the floor and the latter to be folded individually or completely into the floor. In addition, the third row can be flipped completely rearward for tailgate seating, and both rows provide two storage bins for 12 cubic feet of storage space if they are left in an upright position. The mid-tier SE Plus has the addition of a leather-wrapped steering wheel, and the top-level SXT has an 8-way power-adjustable driver’s seat with 2-way power lumbar support. Standard comfort and convenience features include tri-zone manual climate control, an auto-dimming rearview mirror to reduce headlight glare from behind you, rear hooks to secure grocery bags and other types of cargo, a 40 GB hard drive for storing digital media (with 28 GB available), six-speaker audio, an AM/FM radio tuner, an audio jack for hooking up mobile devices, and a 6.5-inch touchscreen display. The upper-level SE Plus and SXT also get remote engine start, Uconnect® infotainment integration, Bluetooth® hands-free phone calling and audio streaming, a remote USB port for charging mobile devices, and a 1-year trial subscription to SiriusXM® satellite radio. Depending on trim, you can further spruce up the minivan by adding features or amenities such as wireless headphones, a five-year trial subscription to SiriusXM® Travel Link service, a Garmin® navigation system, an HDMI port to hook up gaming devices, a second-row entertainment system that includes an overhead 9-inch VGA video screen, a DVD player, and a remote controller. The 2019 Dodge Grand Caravan uses a power rack-and-pinion steering setup to help maintain directional stability at highway speeds and provide a tighter turning diameter for parking maneuvers. The turning radius is measured at 39.1 inches. The minivan has a touring suspension, which means that is tuned to optimize comfort for longer rides. The suspension has MacPherson struts in the front and a twist beam design in the rear. This latest Dodge minivan is powered by the 3.6-liter Pentastar V6, which produces 283 horsepower and 260 lb-ft of torque and is strapped to a 6-speed automatic transmission. The vehicle uses a front-engine front-wheel-drive layout, which enables it to achieve a towing capacity of 3,600 lbs. 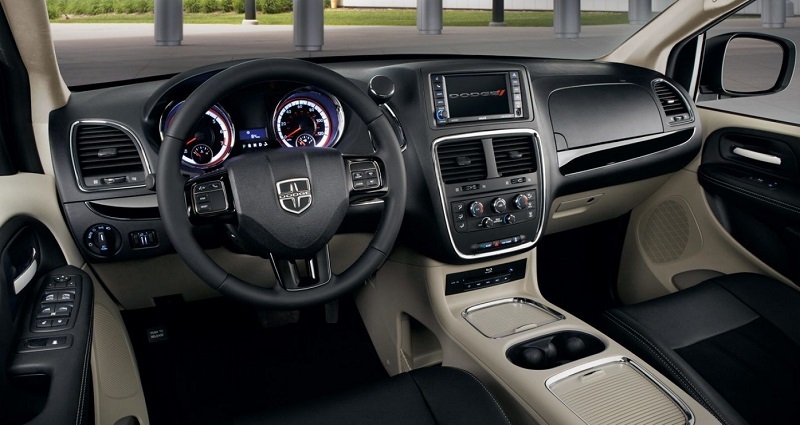 For restraint and cushioning in the event of a collision, the 2019 Dodge Grand Caravan has dual front impact airbags, a driver’s knee airbag, dual front seat-mounted side impact airbags, and side curtains. Other standard safety features include electronic stability control, four-wheel anti-lock disc brakes, sliding door alert warning, speed control, daytime running lights, a rearview camera, and trailer sway warning. For security, the minivan combines keyless entry with engine immobilization. On the SE Plus and SXT, the theft-deterrent system is enhanced by adding a security alarm. Can’t wait to check out the 2019 Dodge Grand Caravan in Amityville? Contact Security Dodge, which is known for serving Amityville Westbury Massapequa Long Island New York shoppers, to set up an appointment. Based in Amityville, Security Dodge has established a reputation for serving Amityville Westbury Massapequa Long Island New York residents. 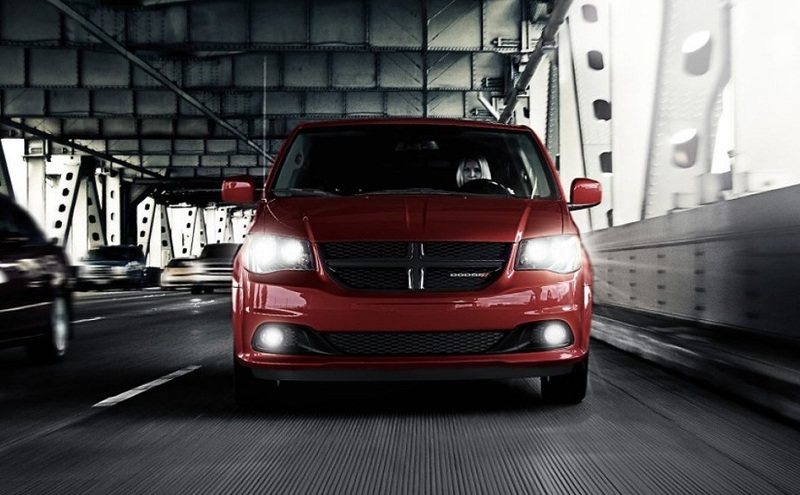 Contact Security Dodge to test-drive a 2019 Dodge Grand Caravan in Amityville at our dealership. Once you contact us, one of our sales experts known for serving Amityville Westbury Massapequa Long Island New York will be able to assist you with narrowing down your search to the Grand Caravan that’s right for you.